Prefab is a buzzy topic in architecture and design circles right now, but it's hardly a new concept. The idea of building houses in factories and shipping them to their destinations is at least a century old. Now, Taschen has published the history of these homes in a lovely coffee table book. 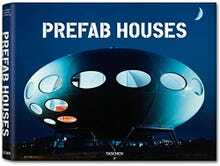 Prefab Houses isn't just a history of mass produced homes. It's the whole story, including how the concept evolved in public consciousness, and what the latest innovations looked like over the years—each era had its own idea about what the future would look like, and that's reflected in the designs. Undoubtably, this is how we should live in the next century. It's cheaper. It's better for the environment. And, well, it's just more convenient to live in a house that you can pick up with a helicopter and move to a new plot of land. Here are a few of the highlights from the book—drop your own favorites in the comments. There's something hopeful about the Kupferhaus's rise in popularity during the 1930s. Designed by architect Robert Krafft and engineer Friedrich Förster, these early manufactured homes didn't look much different than conventionally constructed homes. They came in nine different models, all of which used copper. (Kupferhaus actually means "copper house" in German.) But alas, when 1934 rolled around, Hitler and friends decided they needed more copper for the Reich and production ended. Wisconsin's own Carl Koch is widely regarded as one of the godfathers of the prefab house movement, and the Techbuilt system is the Harvard-educated architect's greatest legacy. The 2,400 square foot, four bedroom Techbuilt House, first erected in Cambridge out of standardized four-by-eight-foot modules, changed the way people people thought about home construction. The name literally means "Six-Shell Bubble House," and you can probably guess why. French architect Jean Maneval designed these houses to be built out of six shells of plastic that would be assembled on site into a six-sided, well, bubble house. He only sold 30 of them. Again, the name says it all. This flying saucer of a structure, made completely out of reinforced plastic, became a legendary representation of space-age thinking back in the late 1960s and early 70s. There are still about 100 of them around the world. This one can also be transported via helicopter. Or flying saucer. Nothing says future like a house with 2000 in the name. This Wolfgang Feierbach house is built using massive fiberglass ribs and boasts an airy open plan interior with a circular bed in the bedroom. The original furniture was even designed by Dieter Rams, though it looks nothing like an iPod. Leave it to the Danes to master sustainable housing decades before it's popular. These two story, two bedroom, geodesic dome-like dwellings are so green, they have grass growing on the roof. The ones in Denmark's Faroe Islands pictured above are designed by Kari Thomson with the help of engineer Ole Vanggaard. Okay, seriously, what's with the hilarious names for prefab houses? The WeeHouse is, well— it's a wee little thing, designed by Minnesota-based Alchemy Architects. This super-efficient home is one of many design-your-own prefab house companies to pop up in the past decade or so. Wait, this is a prefab house? Why is it so big and intricate and beautiful? Because this is the future, and prefab houses aren't just trailers any more. Aside from boasting a beautiful design, these Ray Kappe-designed houses aim for zero impact. Even the factory they're built in minimizes waste. Are we missing any important ones? Have you lived in a prefab house or considered buying one? Tells us below!